This scribble was published on Saturday, August 15th, 2015. You can follow any banter on this scribble with the RSS 2.0 feed. You can share your inspired musings after typing the anti spam word near the bottom of the page. But no Pinging because its too naughty. If you wanted, you could probably run the Android version of their app on your Windows machine using Bluestacks, though I haven’t tried that myself. I can understand your confusion, with the dual usage of the Windows name, something Apple and Google avoided by using OS X/iOS and Chrome/Android respectively. Can’t wait for the India trip reports! Hope you’ve arrived safely. Only one ‘accident’ on the journey, my work laptop bashed my windows phone screen (phone not usable now). 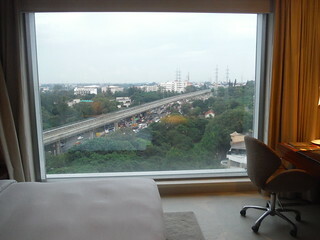 Here safely and disoriented with amazing view from 9th floor of heavily guarded hotel. It’s colder, and more cloudy than Minneapolis. Feels more like being back in the UK! We love the Tripit app. Their website does have a bit more functionality (better editing for individual entries, better trip management) than the app, so I would probably use the website on your Surface rather than the app. I use the website on my tablet (app on my phone). The calendar integration is fabulous and being able to forward reservation emails is so wonderful! In 7 months of travel, we only had a few emails that it couldn’t deal with (mostly in Japan, as the emails contained Japanese or were in an odd format).